I’ve been very lucky lately, the pigeons have been at the farmer’s Brussels sprouts, so for the last couple of weeks (at the Farmers’ Market) I’ve had six pigeon breasts added to my bag of vegetables, as a gift. As I love the taste of pigeon, I’m absolutely delighted! Note, these are Wood Pigeon and unlike their town cousins, live on fruit, vegetables, pollen, bugs, etc. All pigeon are classified as vermin, so there’s no shooting season or licence needed to hunt them. 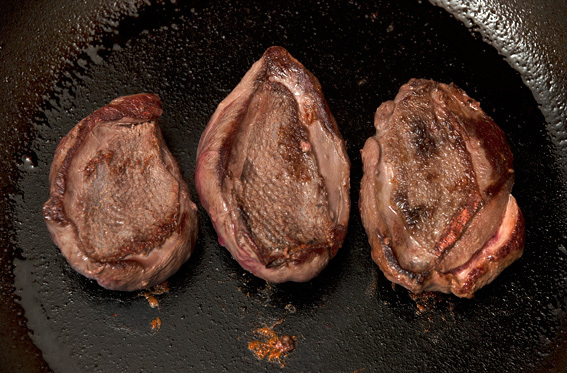 Pigeon do a lot of flying, so there’s not much fat on them, therefore they should be cooked very quickly or braised slowly (otherwise they’ll be tough). I decided to have these medium rare with a cream sauce. 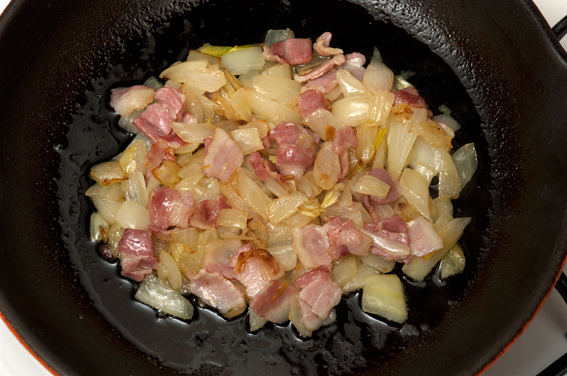 For the sauce: fry a chopped medium onion with 3 or 4 chopped rashers of streaky bacon in olive oil until the bacon has taken a little colour. Add some ground rosemary, sage, thyme, chopped garlic, sea salt and cracked black pepper. Pour on half a pint of home made stock (mine was duck), a large glass of red wine and a couple of splashes of Balsamic Vinegar. 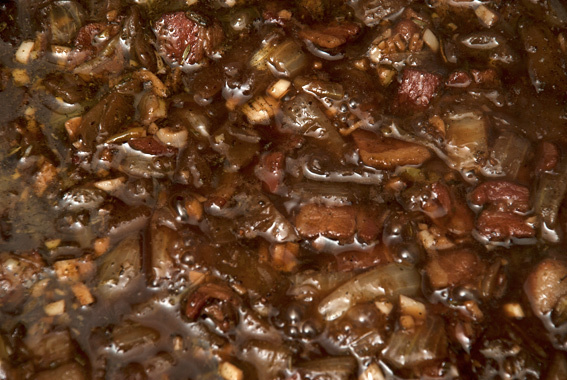 Reduce the liquid to half, taste to see if it requires further seasoning and strain. 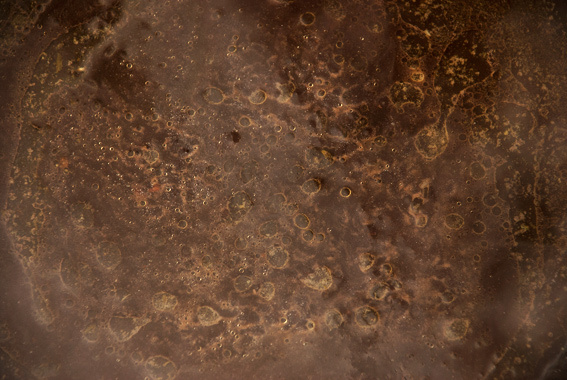 Rub a frying pan with a little olive oil and heat until it starts to smoke. 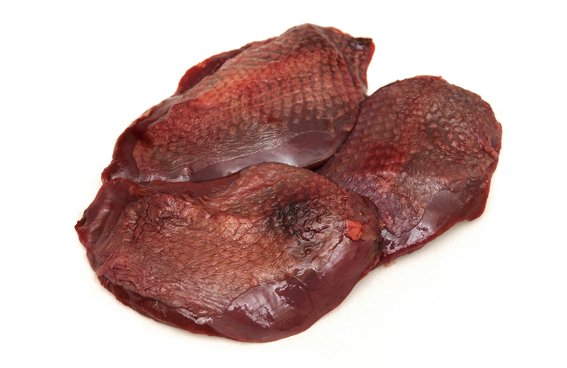 Season with a tiny pinch of salt and pepper then fry the pigeon breasts for no more than 2 minutes per side . Don’t overdo it or they will become chewy. When cooked, place the breasts on a hot plate to rest while you finish the sauce. 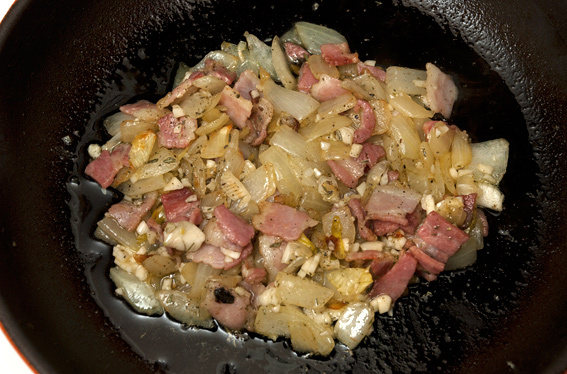 Deglaze the frying pan with the wine and stock sauce. 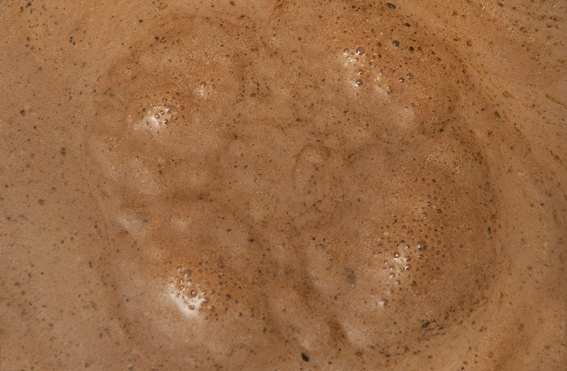 Thicken with a tablespoon full of double cream (or crème fraîche if you prefer). Stir vigorously on a low heat so that the sauce doesn’t separate. 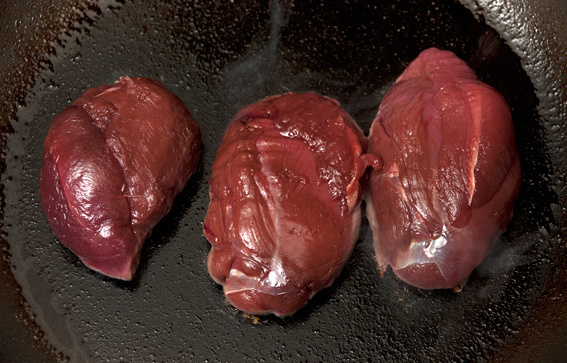 Pour the sauce onto the pigeon breasts and serve with seasonal vegetables. N.B. the sauce is equally good without cream. I enjoyed the pigeon with a glass of Toscar Tempranillo, an organic red from Castilla, Spain. This entry was posted in Drink, Food, Game, Meat, Recipes, Shopping and tagged Balsamic Vinegar, double cream, home made stock, Islington Farmers Market, Perry Court Farm, pigeon breast, red wine and stock sauce, streaky bacon, Toscar Tempranillo, Wood Pigeon. Bookmark the permalink. This looks and sounds amazing! I love pigeon too. Lo Jardinièr and I have been away this week for a celebration and had the most exquisite pigeon dish I’ve ever tasted with (I’m translating roughly) praline of red peppercorns and spices, roast figs and chocolate sauce – memorable! Wow… the meat is so much darker than I would have expected. Almost like liver! The pigeons have been riling me – they’ve eaten pretty much all the redcurrants and I have to completely cover any brassica in netting to stand a chance. Now you’re inspiring me to take revenge! Pink is good. 🙂 If the truth be told, I’d have called what Steve ate that night “rouge, très rouge”! The sauce being very much the key I do not suppose this Colonial need worry if said wood pigeon is not available: use one’s imagination 🙂 ! Would have loved to eat this vermin tho’ !!!! Beautiful dish and a gift too, you lucky thing! We used to have an old boy round here who shot the surplus of pigeons on his Cortijo, but he’s not well now poor thing and can’t shoot anymore. These look absolutely delicious! I do like the hint about flash-frying but not over-cooking…should anyone show up with a brace of pigeons I will now know what to do! Thanks ever so much for the comments on Edible Long Island! I appreciate your support!